In his Are You Selecting Your Customers…Or Are They Selecting You? presentation at CSIA 2010, Dean Streck, CEO of V I Engineering, offers ways to assess the value of your customers. 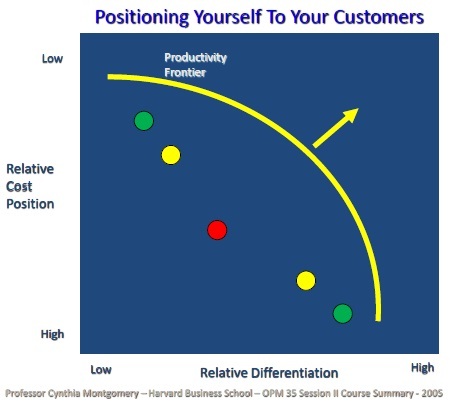 Based on this analysis, you may reach the conclusion that some of your customers are more valuable than others. And, some, well, they just aren’t worth keeping. 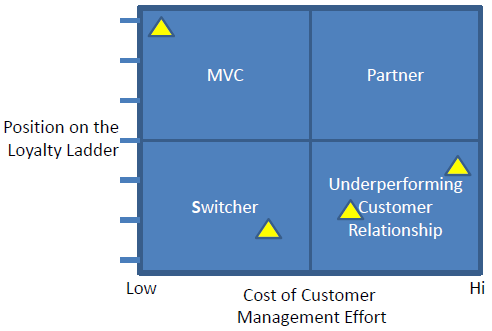 You can then position the customer in a matrix comparing their loyalty position and the cost of managing that customer. The combined result obviates which customers are the ‘most’ valuable (a.k.a. partner) and well as the ‘least’ valuable (the Switcher). Start by identifying the customer management activities required to support a relationship at each rung. 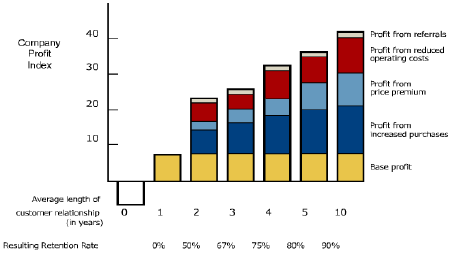 Then, quantify the buyer benefits associated with each ladder rung. You can then calculate the cost incurred in moving a customer from one rung to another using a combination of historical data and account manager’s experience. And, map Customers Current Position. You can also devise strategies for moving customers to the partner level. For instance, perform a Root Cause Analysis for a customer. Are there difficulties due to competitive effort, ineffective account management, or simply idiosyncrasies? Based on the results, you can define activities and timelines to move the customer to a more valuable position. Finally, you must determine how to deal with the least valuable customers. Perhaps, you can engage them in a frank conversation about how they are too difficult or expensive to retain your services any longer. If they are unwilling to help you change this situation, you may be better off ‘firing’ them and find a better customer. But, keep in mind that shifting customers and industries can be very costly and time consuming. The role 80-20 rule, also known as the Pareto principle applies. Business management thinker Joseph M. Juran suggested the principle and named it after Italian economist Vilfredo Pareto, who observed in 1906 that 80% of the land in Italy was owned by 20% of the population. It is a common rule of thumb in business: 80% of your sales come from 20% of your clients. 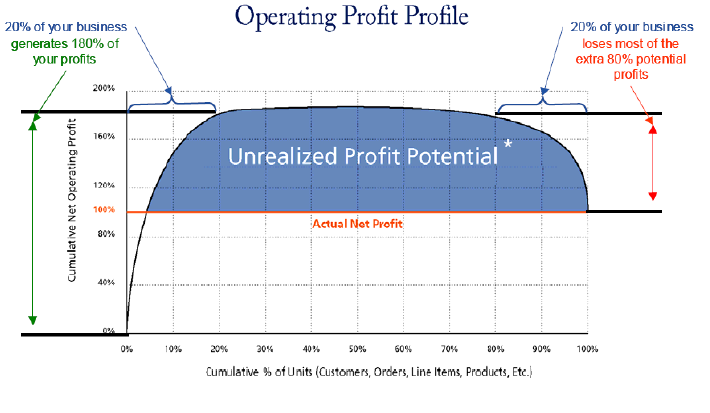 Dean goes further to show that your top 20% of your business actually generates 180% of the profits. 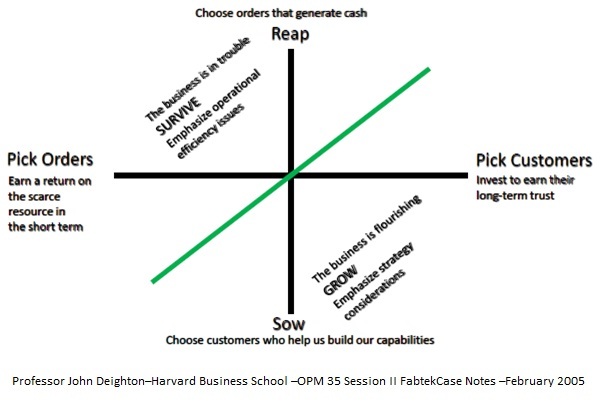 The middle 60% of your business is basically breakeven. And bottom 20% of your business loses the 80% of potential profits. The revelation that 20% of your customers generate the bulk of your profit and the ‘other’ 20 percent cost you most of that profit, then raises the question. What should I do about it? Should I just focus on the top 20%? Should I fire the rest? What about everyone in between. In the next couple of posts, we will look at techniques to deal with these issues.